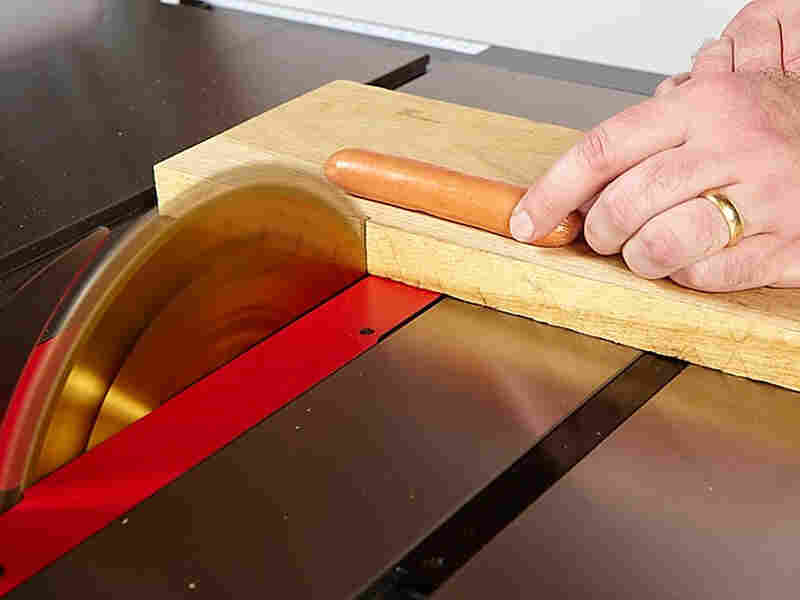 Despite Proven Technology, Attempts To Make Table Saws Safer Drag On It's unclear whether the Consumer Product Safety Commission will finally pass a rule requiring all new saws to have an active injury prevention monitoring system built into them. Every day, more than 10 Americans suffer amputations on what is by far the most dangerous woodworking tool: the table saw. Regulators in Washington, D.C., are moving closer to adopting a rule that would make new saws so much safer that they could prevent 99 percent of serious accidents. But even after more than a decade of study, and the existence of a proven technology that all sides agree works astoundingly well to prevent injuries, it's unclear whether the Consumer Product Safety Commission will finally pass a rule requiring all new saws to have an active injury prevention monitoring system built into them. 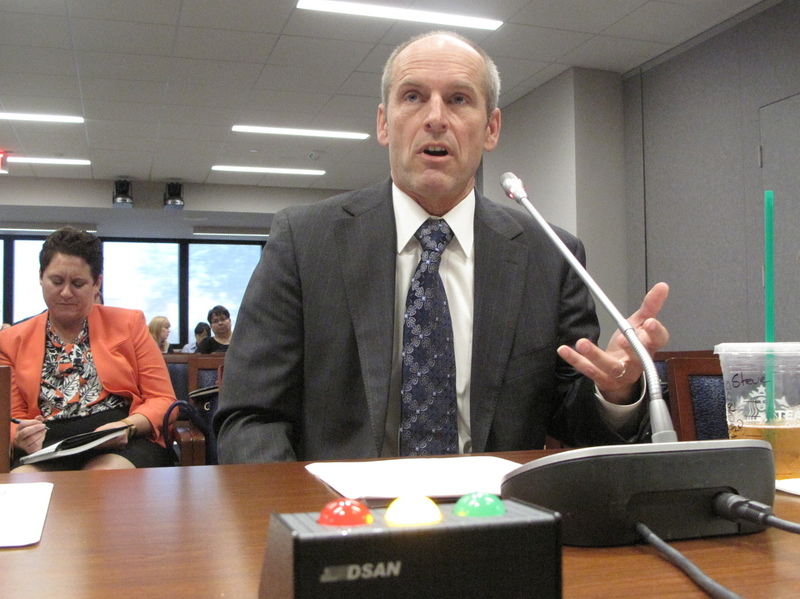 SawStop founder Steve Gass testifies at a Consumer Product Safety Commission hearing. We did our first story on this issue in 2004. I saw a small ad in the back of a woodworking magazine. It read something like "SawStop, the table saw that won't cut off your fingers." That sounded like a pretty good innovation. A table saw has a big, jagged metal blade that spins at 100 mph, and a lot of people get hurt using this type of saw. I called the company and talked to inventor Steve Gass. He had this amazing story to tell. "I was just out in my shop one day, and I happened to look over at my table saw and thought, 'You know, I wonder, if you ran your hand under the blade, if you could stop it quick enough that you wouldn't get a serious injury,' " Gass said. "And it seemed doable." Gass is a physicist and he designed a saw that could tell the difference between when it was cutting wood and the instant it started cutting a human finger or hand. The technology is beautiful in its simplicity: Wood doesn't conduct electricity, but you do. Humans are made up mostly of salty water — a great conductor. The SawStop senses an electrical current in the hot dog. Gass induced a very weak electrical current onto the blade of the saw. He put an inexpensive little sensing device inside it. And if the saw nicks a finger, within 3/1000ths of a second, it fires a brake that stops the blade. 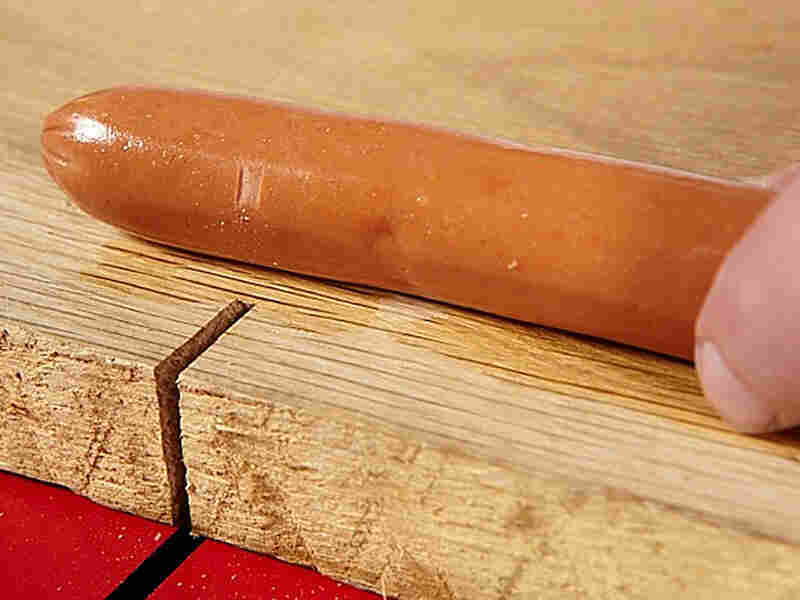 Gass demonstrates this in an epic video using a hot dog in place of a finger. The blade looks like it just vanishes into the table. There was a big need for this invention. Every year more than 4,000 Americans suffer amputations — get their hands mangled using table saws. 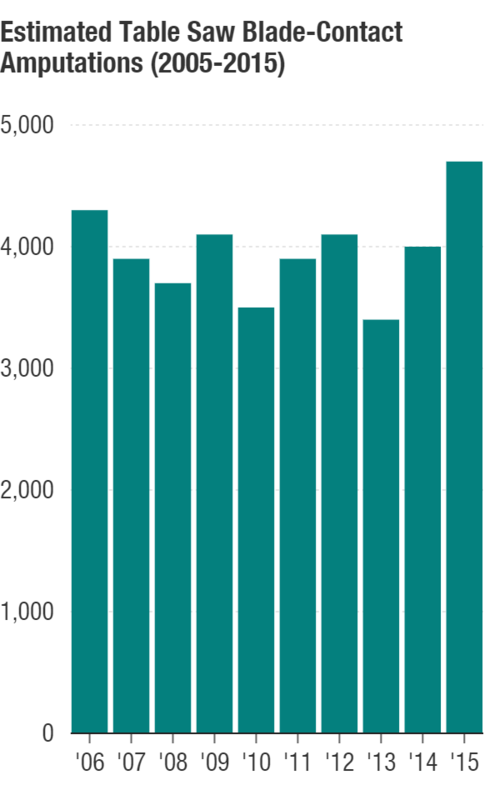 Upwards of 30,000 people wind up in emergency rooms with lesser injuries. And Gass had figured out a safety brake that could prevent those accidents. A hot dog with a slight nick. He called all the major power tool companies telling them about his breakthrough, but none of them wanted to buy his safety brake. He says one company told him "safety doesn't sell." "I was just shocked," Gass says. "That's crazy." Gass started his own saw company and proved the technology worked. In 2003, he petitioned the Consumer Product Safety Commission asking it to require the rest of the industry to make their saws safer, too. On Wednesday, Steve Gass was back in Washington at a CPSC hearing — this time asking: Why haven't you done this yet? "You commissioners have the power to take one of the most dangerous products ever available to consumers and make it vastly safer," Gass said at the public hearing. "And yet, here we are over 14 years later after this petition was initially filed, still engaged in a glacial process with an uncertain end. There's no time left to waste." 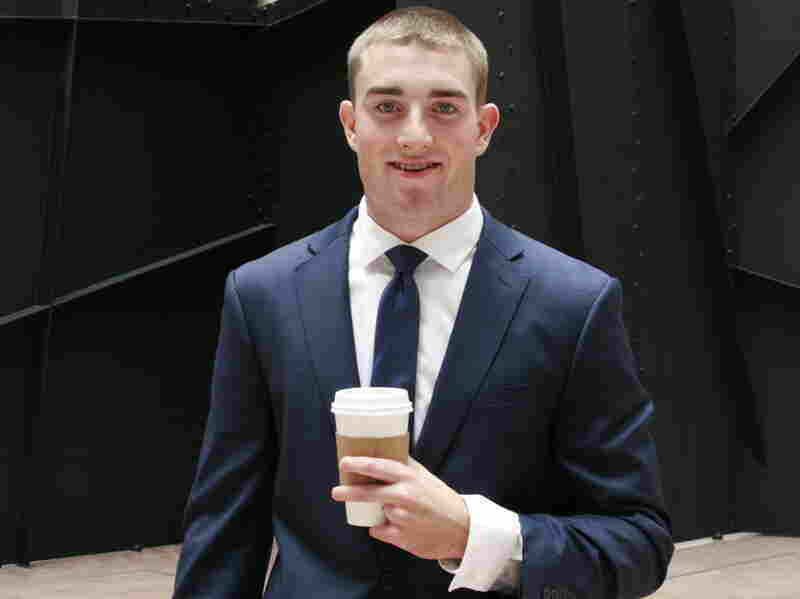 Joshua Ward was injured by a table saw during a high school class in 2013. Earlier this year, the safety commission voted to take a key step toward a new safety rule for table saws. The CPSC staff recommended creating a mandatory standard requiring them to have sensing technology that could stop the blade to prevent injuries. And it has issued a draft of the proposed rule for public comment. Gass told the commissioners that history has continued to prove his technology effective. To this day the company says SawStop has never been involved in a serious table saw accident and has documented more than 5,000 "finger saves." He estimates his saws are "99 percent" effective at preventing injuries. The hearing was also a chance for the broader industry and the public to weigh in. Joshua Ward from Oregon wanted to be there. In 2013, Ward was in a wood shop class in high school when a table saw jerked the wood he was cutting in a way that sent his left hand smashing into the spinning blade. Four of his fingers were either cut off or badly mangled. Beyond the surgeries and the pain, Ward says it has limited his life. His dad's a firefighter and he says he grew up in the firehouse with his dad every day. "It's kind of been a lifelong dream of mine to be a firefighter; it's been in my family forever, and this injury has put that to an end," Ward says. "As we speak it's about 12:30," Ward says. That means "six people have already had fingers amputated today. And there's going to be another 10 tomorrow. So I come with frustration and I'm really hoping that we adopt this mandatory standard." Even after all this time, it's unclear whether the CPSC will vote to adopt the rule. The industry for years has had a long list of complaints and concerns about mandating this kind of safety standard. For one, adding the safety technology will add cost to the saws. The industry has said the cost is too onerous. But those cost estimates have ranged over time. CPSC commissioners in favor of the rule point out that the $200 price difference is dwarfed by the financial cost, and pain and harm caused by 30,000 ER visits and more than 4,000 amputations every year. CPSC's analysis puts the annual cost of table saw accidents at around $4 billion. Susan Young with the industry group the Power Tool Institute claimed at the hearing that some of the commission's research in this area is flawed. She said the proposed rule needs even more study and "lacks essential data from critical studies currently being conducted and continuing throughout 2017." If Table Saws Can Be Safer, Why Aren't They? Other commissioners said the rule wouldn't create some kind of unfair monopoly. They said that's not the CSPC's concern anyway — which companies win or lose because of a safety rule. Sally Greenberg, the executive director of the National Consumers League, agrees. "That isn't their job. Their job is to get safer products to the marketplace," she says. Meanwhile, Congress has thrown up a roadblock against safer saws. The House Appropriations Committee approved a bill for the 2018 fiscal year that includes a clause prohibiting the CPSC from acting on table saw safety. "None of the funds appropriated by this Act may be used to finalize any rule by the Consumer Product Safety Commission relating to blade-contact injuries on table saws," the rider on the budget bill reads. Republican Rep. Tom Graves of Georgia, who chairs the Financial Services and General Government subcommittee where the rider originated, was unavailable for an interview. The Power Tool Institute has already invested tens of thousands of dollars this year to lobby Congress against the CPSC rule. But the rider has not yet passed in the Senate, where Greenberg, of the National Consumers League, says it may be easier to remove. With uncertainty about how to move forward, CPSC Commissioner Elliot Kaye had a message for Joshua Ward, who was injured in a wood shop class. "Mr. Ward, I want to apologize to you personally that we failed you, and that we continue to fail the 10 victims per day that you mentioned earlier," Kaye said. "We should do better. We can do better." For his part, CPSC Commissioner Robert Adler hopes his agency will push ahead with a final rule requiring safer standards for table saws. "Oh, absolutely I do," Adler said. "These injuries are many, they are ghastly and I believe the technology will eliminate almost all of them." For now, the CPSC will be analyzing public comments. It might revise its proposed rule after that. Then the commission could vote on whether to make table saws a whole lot safer.